Backflow preventer enclosures come in a variety of materials all with various levels of protection. 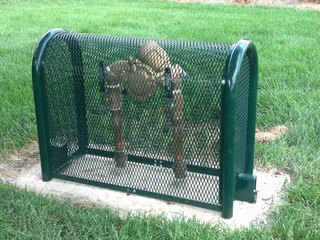 For backflow prevention devices 3" and smaller, it's very common to see backflow cages. These cages are typically made of expanded metal and are relatively inexpensive to produce in small sizes. This is what has led to their popularity for irrigation/sprinkler backflow preventer protection. Backflow protection cages are also popular in warm environments like Arizona and California where there is little to no danger from freezing. This is the best use of these types of enclosures, because they offer no freeze protection and can't be relied upon during the winter in most areas. Whatever climate you're in, here's what you need to know about backflow cages. Protection: These have no insulation at all to provide frost or freeze protection, but do provide some vandal, accident and thief protection as they are typically powder coated steel and do include a locking mechanism. Sizes: from about 24" x 24" up to around 60" x 60"
Important to Note: These are only able to be used in situations where the temperatures do not fall below 33° Fahrenheit as they do not provide either frost or freeze protection. They can be used in conjunction with an insulated bag. They are typically only sold for backflow assemblies 2" and smaller, although larger sizes are used in some areas. 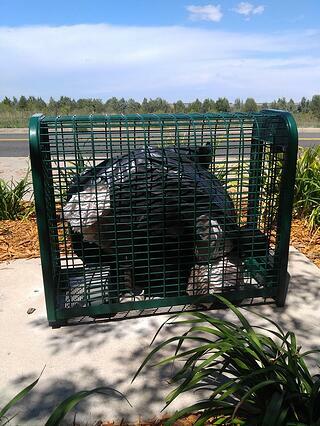 Cages are designed to protect devices from theft and vandalism. Backflow valves are made of copper, brass, or galvanized steel pipe. These are valuable metals and when the recession of 2008 began, backflow preventer theft increased dramatically. 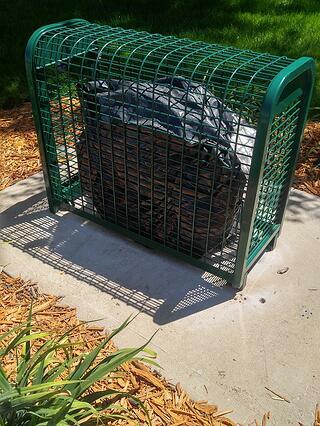 Areas that previously didn't need an enclosure now did to prevent this theft. They had a few different options, and cages became the go to solution for these areas. Since they didn't require freeze protection, cages would work well for them. Backflow cages were perceived as more cost effective than aluminum or fiberglass enclosures, and this was certainly the case at the time, and the pop up of multiple backflow cage manufacturers supplied the demand and established the habit of using cages. The cages were relatively inexpensive, they were easy to get, and they acted as a sufficient deterrent to theft. Cages offer no protection from the elements and are really only useful in climates that rarely, if ever, reach temperatures below freezing. In order to provide any insulation to the pipes, the user must either purchase an insulating bag, or take matters into their own hands if the weather turns. Surprisingly, cages are sometimes prevalent in areas that do freeze regularly, such as Denver, Colorado. It's common to see irrigation backflow preventers from .75" to 4" in cages year round. During the colder months, they are often wrapped in garbage bags. The reason for this popularity, is because cages were the most cost effective option when they first came on the market. However, the cost of manufacturing other solutions, such as fiberglass enclosures and aluminum enclosures, has become more comparable to the cost of manufacturing cages. Now, these options cost about the same. Insulated enclosures provide extra protection - not only from the climate, but also further protection from thieves. A simple, boring box is much less likely to be tampered with than a see through cage. This is because a would be thief already knows there is valuable metal inside a cage because they can see it. That's not the case with an aluminum enclosure. Here's more on the difference between backflow cages and enclosures. There are many companies that make cages for backflow preventers and other equipment. They come in a variety of sizes, and you do have the option of ordering a custom size. 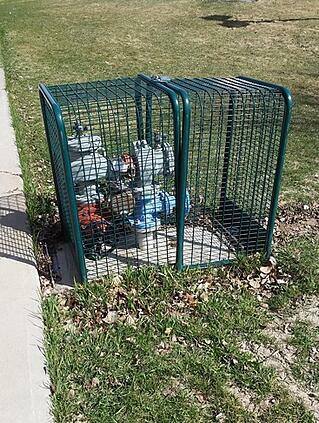 Backflow preventer cages have been in the market for decades. They are most popular in warm climates. These have no insulation at all to provide frost or freeze protection, but do provide some vandal, accident and thief protection as they are powder coated steel and do include a locking mechanism. They became popular when the housing market crashed in 2008 and metal theft went on the rise. These cages were advertised as the cheapest most dependable solution to this theft. Unfortunately, they are often only protected with a cheap lock and since the thief can actually see what they are looking for, are less likely to deter theft than a solid enclosure. Cages used to be a less expensive alternative, but are now about the same price as an aluminum enclosure. They are useful in warm environments that do not have below freezing temperatures.